A video of Mark Zuckerberg working out with his toddler in a baby carrier on his back has come under fire from the internet, over concerns the Facebook founder was putting his daughter at risk. It’s lovely when you see dads enjoying their children’s company, and including them in everyday things like workouts. But when Mark Zuckerberg posted a cute video that showed him working out with his daughter, Max, in a carrier on his back, he came under intense scrutiny from other parents citing a concern for Max’s safety. Many believed it was a dangerous manoeveur without providing proper support for her neck as he performed the pull-ups. Mr Zuckerberg posted the video on his Facebook profile on Friday, and it has since been viewed over 3 million times. In the video, Mr Zuckerberg easily manages several pull-ups with his 16 month old daughter, Max strapped to his back. Many commenters praised the happy dad for spending quality time and encouraging a healthy pursuit like exercise with his daughter. Others, however, were quick to point out that little Max may be unsafe in her baby carrier – mostly because of the way she lets her head drop back during the exercise. Ouch. That’s fairly judgemental stuff towards a dad who is simply enjoying some quality time with his daughter. 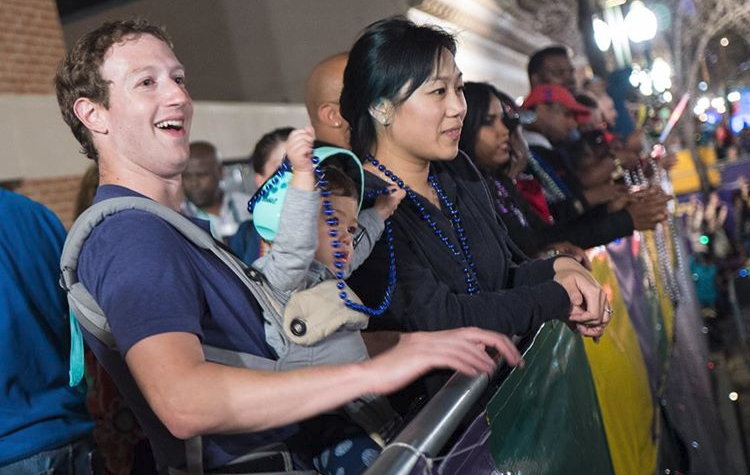 It looks like Mark is big on babywearing and Max seems to enjoy it just as much, as this recent photo from New Orleans’ Mardi Gras shows. Of course we know that neck support is extremely important for babies, but by approximately six months, babies should have enough neck muscle and control to hold their head steady on their own. At 16 months of age, Max would be quite able to support her own head if she had chosen to, though it does look a little precarious and uncomfortable from a viewer’s perspective. As many readers point out, Zuckerberg’s movements are slow and steady, with no jerking or thrashing involved, and little Max seems perfectly happy. Meanwhile, who knew Mark Zuckerberg was so fit!? What do you think? Is Mark Zuckerberg really putting his daughter at risk with this workout? Or is it a bit of an over-reaction to an innocent video?